‘In South Africa, we use the term San rather than ‘Bushmen’. However, Botswana’s Bushmen still prefer that name,’ my M&G Style Guide advises me. The San then applies as a relatively neutral term for a range of hunter-gatherer, first nation peoples such as the !Xóõ and Ju|’hoansi and many others. The San have had many enemies. Merely recounting the injustices they have suffered and the pogroms unleashed against them risks dehumanizing them still further. Their ancestral lands in Namibia and Angola have been ravaged by wars; in South Africa and Botswana by multinationals and farmers. Some groups still find themselves up against gigantic mining corporations. Their history is not particularly disputed, but what is controversial is what ought to be done about it. Even “friends” such as the San have had, makes one wonder who needs enemies. Dreamy mythomaniacs such as Laurens van der Post romanticized and nearly patronized them out of existence. For almost 30 years, the South African Defence Force offered (or compelled, depending on circumstances) jobs, education and protection for !Xun and Khwe. Nobody, including the San, thought to ask what might happen when they lost the war. More recently, some tourist facilities became veritable human zoos. There are currently about 100 000 people in southern Africa who count themselves as San, of which only about 6700 reside in South Africa. Throughout the region they still suffer racial prejudice and social and economic marginalization. Situated 70 kilometres north of Cape Town, just off the R27, !Khwa ttu, a San culture centre, is an initiative of the Working Group of Indigenous Minorities in Southern Africa and a Swiss philanthropic foundation. !Khwa ttu is in the ancestral lands of the |Xam and means ‘water pan’. I’m not sure what to expect as Munchkin and I drive up the track to !Khwa ttu. We are in luck. There are several majestic Eland, their shapes redolent of cave paintings, ruminating near the road, followed by a group of alert ostriches. 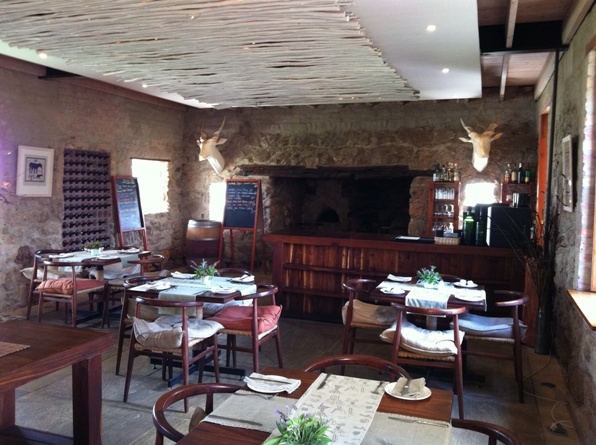 The restaurant is next to the crafts and bookshop in the renovated old farmhouse. It is open for breakfast and lunch. It isn’t what I imagined at all; this is one smart, 60-seater dining area. Stone walls, wine racks, those wire and paper trophy heads of antelope lit from inside on the walls, and a roaring fireplace. The winelist is written for novelty on a large green wine bottle. Mark-ups are sensible and there is an adequate selection of wines, many from the region. The menu is in multi-coloured chalk on several blackboards and the prices are reasonable (breakfasts around R40; starters R36-R48; main courses R68 –R95; desserts R32). Yet as soon as the food arrives it is clear the kitchen is equipped with a professional chef. The springbok carpaccio, served with a poppadum, is a healthy sized portion of not very thin slices (for carpaccio), fresh and deep madder in colour, with a few dots of balsamic syrup on the plate and served with paw paw, which ideally could have been riper. The Eland pâté isn’t the buttery affair we are accustomed to with duck and liver, but instead is crumbly and resists being spread on the large slices of freshly baked potbread. It is accompanied by a ramekin of snake berry chili jam that has a mild bite. Snake berries or Cape boxthorn (Lycium ferocissimum) forms large bushy shrubs that can be 4 metres high. After lunch, our trainee waiter, Andre, from the ‡Khomani community of the southern Kalahari, shows me one of these shrubs growing next to the restaurant. He tells me birds like to nest in them because the thorns protect them, and true enough there is a small nest inside. For mains there are the usual South African favourites, such as lemon chicken and beef fillet with green peppercorn sauce. For vegetarians there is couscous with butternut, feta and aubergine. But Munchkin and I decide to swop animals for the mains. This time I have the springbok, a pie, piping hot in a crispy pastry that is tastily blackened in places by the oven, on top of a light mash with carrots and whole green beans. The Eland bobotie is lean and airy, with a cumin fragrance, a thin egg topping and served with plain white rice. For desserts I attempt the pecan nut tart, which is not particularly nutty but rich and jammy, with a drizzle of honey and vanilla ice-cream. I can wholeheartedly recommend that readers visit the restaurant. While there be sure to take in some of the many activities the centre has on offer – overnight accommodation, campfire dinners, sundowner drives, tours that include tracking animals, indentifying plants, sharing stories and learning words in the San languages. This article appeared in the Mail & Guardian, 8 July 2011.